The most expansive winter storm on record has passed, electrical power has been restored, kids are back in school, and the trees and limbs that snapped like toothpicks under the weight of enveloping snow and ice are being cut up and hauled away to become next year’s firewood. If you have been following our gutter guard testing and review videos on YouTube, you have seen that we are currently reviewing several gutter guards to understand how they perform in snow and ice during the winter months. For this installment, we shot photos of the gutter guards instead of video. To recap, we are testing micro mesh gutter screens by Leaf Solution, Leaf Filter, and Diamond Back; perforated metal screens from Leaf Relief and Gutter Rx; a plastic perforated screen from Amerimax, and a handful of expanded metal and aluminum screens. 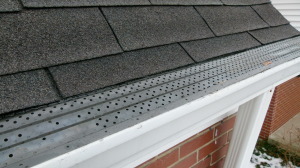 We also added open cell foam gutter inserts from GutterFill and Leaf Defier to the gutter guard review. On a testing note, we shuffled the gutter guards around in an attempt to provide more accurate test results. Leaf Solution had greater exposure to the elements than LeafFilter, which was protected by a dormer that sits a few feet up the roof, so we moved Leaf Filter to a similar position as Leaf Solution on the opposite side of the dormer. We added foam gutter filters from GutterFill and Leaf Defier in LeafFilter’s former position. We also moved GutterRx to an outside position at the opposite end of the gutter from Leaf Solution, and we changed its orientation by sliding it under the first course of shingles. By installing Gutter Rx at an angle, it will be in contrast to Leaf Relief, which has to be installed flat in the gutter. Since we last reported in January, this region has received more ice than snow, which, when combined with high winds, did a number on trees and power lines. While power was out for several days and uprooted trees dotted the landscape, the overall impact of ice on the gutter guards was negligible. 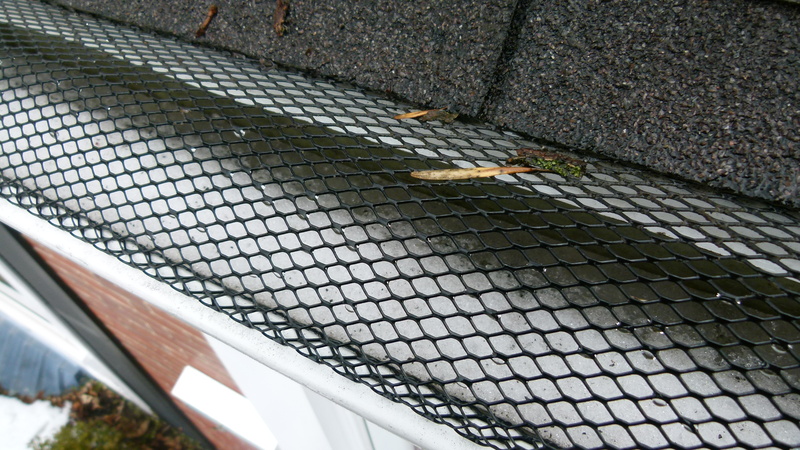 • Virtually all the snow and ice had melted off of the Leaf Solution micro mesh gutter guard. There was a very small amount of ice remaining in one area on the gutter guard surface, but the majority of the surface had no snow or ice on it. 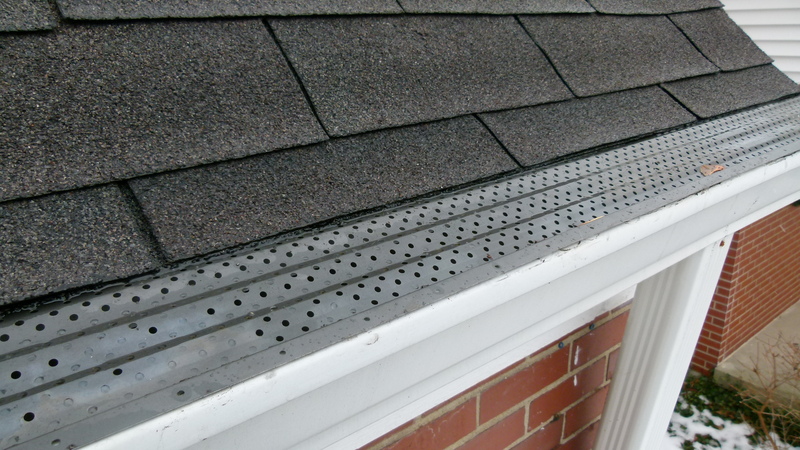 Since the gutter guard was installed under the shingles, the slope is significant enough that snow and ice melted more quickly because it had more exposure to the sun than gutter guards that were positioned flat or nearly flat in the gutter. • Leaf Solution High Flow micro mesh gutter guard was snow and ice free. 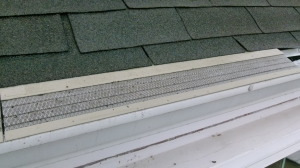 Also installed under the shingles, and incorporating a larger weave screen than the standard Leaf Solution, melting snow and ice had no trouble passing through the screen into the gutter. • New additions to the test, GutterFill and Leaf Defier had a 3/8″ to one-half inch layer of ice sitting on top of the gutter filters. 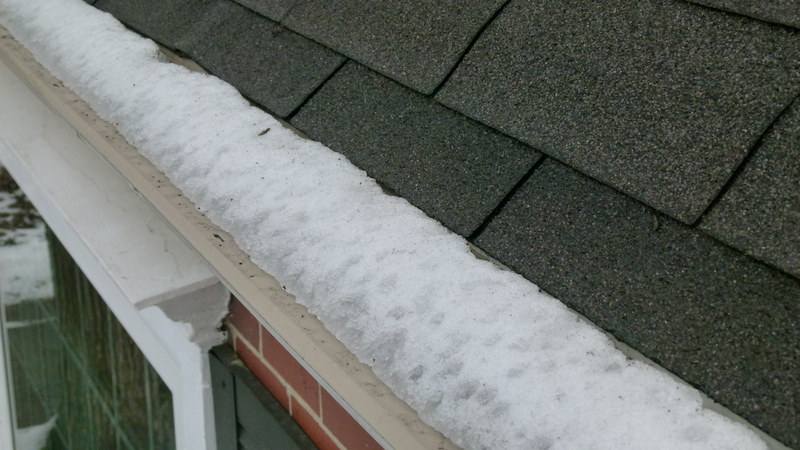 The ice spanned the length of the gutter filters, and covered the majority of the top surface area. • LeafFilter had a 3/4″ to one-inch layer of snow and ice that covered the entire length and width of the gutter screen surface. 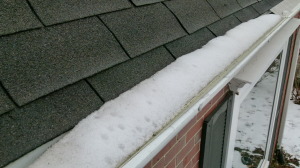 Since LeafFilter sits within the gutter rather than under the shingles, its slope is not as steep as Leaf Solution, so the snow and ice accumulated and was slower to melt off the screen. • Leaf Relief is still recovering from the last round of snow, as additional snow and ice collected on the surface area–encroaching on the asphalt shingles. 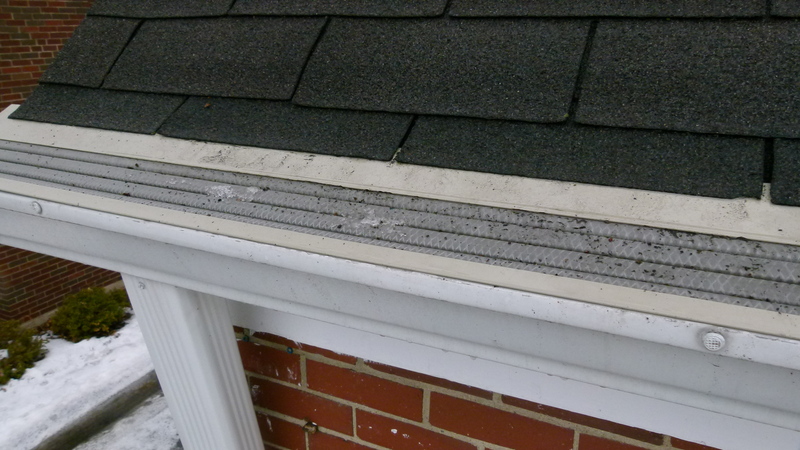 Since Leaf Relief was installed flat in the gutter, it has accumulated the most snow and ice, which is melting more slowly than the other gutter guards. • The black diamond pattern expanded metal gutter screen was free of snow and ice after one week. What had melted off the surface had either washed through or refroze inside the gutters. Its black paint scheme and porous surface helps snow and ice melt more quickly from the surface. • Amerimax 86270 is holding its own. The plastic screen hasn’t collapsed under the weight of ice and snow, and most of the ice had melted off of its white, reflective surface. • The snow and ice on the Diamondback micro mesh screen had mostly melted. 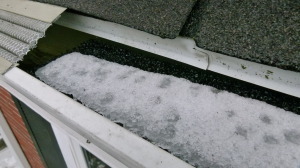 You can see in the picture that there is some remaining slushy ice resting between the roof shingles and the gutter guard. You can also see the water pattern on the screen that shows it is mostly wet. At the time we took the photos, it was snowing, so the snow had melted on the screen surface and filled the small openings. • LeaFree was clear of any snow and ice at this point in the test and was operating normally. • GutterRx was also free of snow and ice in our latest test. In the previous test, when Gutter Rx was installed flat in the gutters, it had accumulated a fair bit of snow and ice on its surface. Since moving and reinstalling it at the same pitch as the roof, this gutter guard shed all of the ice and snow off of its surface. Top performers in this snow and ice test were Leaf Solution High Flow, the black expanded metal screen, LeaFree and GutterRx gutter guards because they were completely free of ice and snow one week after the storm. All the other gutter guards had a nominal to significant amount of snow and ice remaining on the top surfaces. The bottom performers, with the most snow and ice remaining on the gutter guard surfaces, were Leaf Relief and LeafFilter. 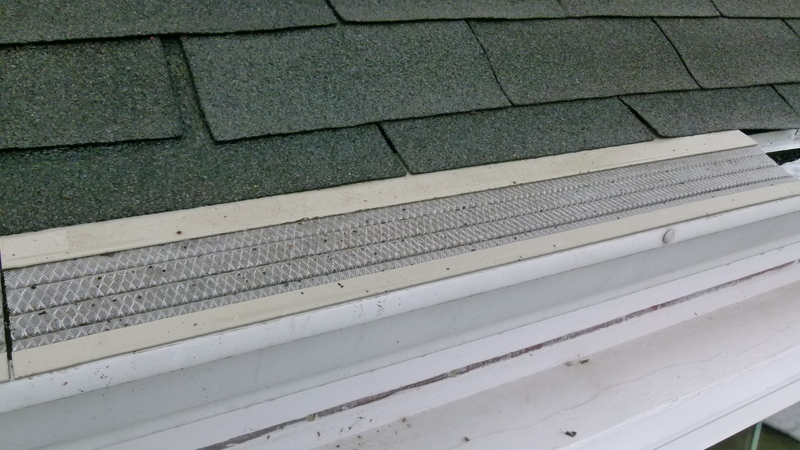 These two products reside within in the gutter opening rather than under the shingles. LeafFilter has a gentle built-in slope and Leaf Relief is completely flat, resulting in the most snow and ice accumulation.